The latest Pew Research/National Journal Congressional Connection Poll, sponsored by SHRM, which was conducted July 8-11 among 1,001 adults, finds a growing partisan gap over the importance of Congress addressing the job situation. Nearly nine-in-ten Democrats (89%) view jobs as a very important priority for lawmakers to address, compared with 72% of Republicans. 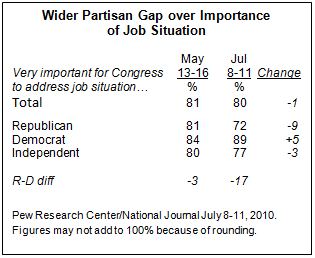 In May, comparable percentages of Democrats (84%) and Republicans (81%) said that it was very important for Congress to address the job situation. More Americans disapprove than approve of the U.S. Justice Department’s decision to challenge the state of Arizona’s recently passed immigration law in federal court. Just under half (45%) say they disapprove of the federal government’s decision to file a lawsuit seeking to overturn the law; 36% say they approve of the move, according to the latest Pew Research/National Journal Congressional Connection Poll, sponsored by SHRM. About two-in-ten (19%) say they do not know. 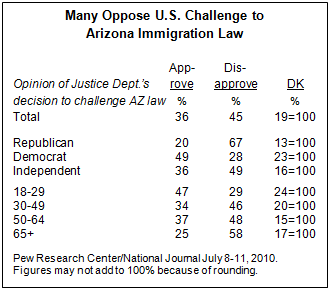 There are large partisan differences over support for the federal lawsuit challenging the Arizona law. By a margin of more than three-to-one (67% to 20%), Republicans disapprove of the suit filed by the Obama administration on July 6, while more Democrats (49%) approve of the decision than disapprove (28%). Independents mirror the public as a whole (36% approve, 49% disapprove). Young people are more supportive than older people of the Justice Department action. Almost half of those ages 18-29 (47%) approve of the decision to file the legal challenge, while 29% disapprove. Among those 65 and older, the sentiments are reversed. Close to six-in-ten (58%) disapprove of the decision, while 25% approve. In late June, a Pew Research survey found broad support for the Arizona measure. The law, set to take effect July 29, gives police greater authority to investigate the legal status of anyone they have stopped or arrested if they suspect that the person is in the country illegally. 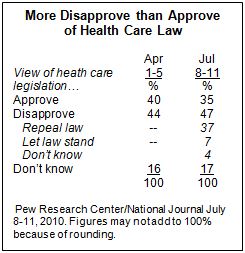 By two-to-one (64% to 32%), more said they favored than opposed the law. More than eight-in-ten Republicans (84%) said they approved of the law, along with 65% of independents. Democrats were divided (50% approved, 46% disapproved). In addition to support for the Arizona law, the June survey found strong support for providing a way for illegal immigrants currently in the country to gain legal citizenship if they pass background checks, pay fines and have jobs. Support for the so-called path to citizenship had increased somewhat from 2009 (from 63% to 68%). Public opinion about the war in Afghanistan has been relatively stable over the last several months. Today, a 49% plurality says that the military effort in Afghanistan is going very (9%) or fairly (40%) well, while 40% say the effort is going not too (31%) or not at all (9%) well. Opinion about the war is little changed since a Pew Research Center poll conducted in the middle of last month. A week before Gen. David Petraeus took over command of U.S. forces in Afghanistan from Gen. Stanley McChrystal, 48% of Americans said things were going well in Afghanistan while 45% said they were not going very well. troops in Afghanistan until the situation has stabilized. Nearly half (47%) say the troops should remain until the situation is stable, while 42% say they should be removed as soon as possible. This is largely unchanged from mid-June, when 53% favored keeping U.S. and NATO troops in Afghanistan and 40% were opposed. There continue to be partisan differences in views of how soon to bring troops home from Afghanistan. Today, just 36% of Democrats say that troops should remain until the situation in Afghanistan is stabilized while 51% say they should be removed as soon as possible. Republicans by greater than two-to-one (65% to 26%), favor maintaining troops in Afghanistan. Independents are divided over whether U.S. and NATO forces should remain (46%) or be removed (44%).